A celebration of bicycles is going on this week across the country. Here in Los Angeles there are a bunch of events culminating in this Thursday's Bike to Work Day and Friday's Bike to School Day. Click here for a list of events in your area. I hope this week more Southern Californians give biking for fun or commuting a try. I started bike commuting to work two years ago and love it. Not only do I reduce my carbon footprint by not burning gas, but I save money by not buying fuel. In addition to the environmental and financial benefits of biking, there are the health benefits. 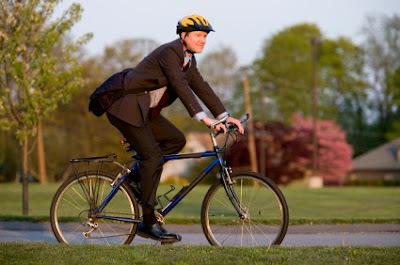 I get exercise every day by biking to work and back, and I save myself the stress of driving. Also, when you are biking you are more aware of the people, architecture, neighborhoods and mom-and-pop shops that make up Los Angeles. When you are racing by in your car you miss out on so much of this great city. And bicycling L.A. is going to get even better and safer once the Bike Plan is implemented. The city is going to place sharrows, bike lanes, signage and other bike-friendly features across the city. Click here for more information on the Los Angeles Bicycle Plan.